"What we've seen is that Russia and China from Ukraine, to mucking around in our democratic elections in the case of Russia, to China's militarization of features in the South China Sea, we have seen them choose to become strategic competitors with us, versus what at one time we had hoped would be some level of partnership," Mattis said. 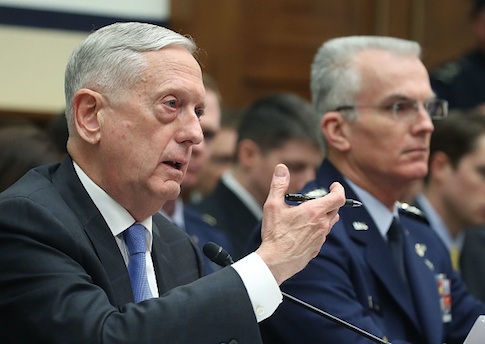 The defense secretary made the comments during House Armed Services Committee testimony along with Vice Chairman of the Joint Chiefs of Staff Air Force Gen. Paul Selva on the Pentagon's latest Nuclear Posture Review, made public last week. The nuclear review represents a major shift from the Obama administration's 2010 review that altered U.S. military doctrine away from relying on nuclear weapons under the since-outdated assumption Russia was no longer an enemy. Mattis and Selva also testified on the Pentagon's new defense strategy that makes countering threats from nation states such as China, Russia, Iran and North Korea a higher priority than fighting Islamic terrorism. The nuclear review calls for modifying a small number of submarine-launched nuclear ballistic missiles with smaller warheads. It also says the Pentagon will re-deploy sea-based nuclear cruise missiles with small warheads. All sea-based nuclear weapons were deactivated beginning in the 1990s under the George H.W. Bush administration. The shift was prompted by Russia's development of an array of new nuclear arms and delivery systems, including low-yield weapons Moscow says will be used early in a conventional conflict to compensate for weaker conventional armed forces. Mattis also said American nuclear deterrence needs to be bolstered because the Russian nuclear buildup includes a new nuclear-armed torpedo. "We are not developing, for example, nuclear torpedoes," he said. "Our nation is quite capable of developing new weapons, as you know, and unlike Russia, for example, we have chosen not to do that." Mattis denied assertions made by anti-nuclear advocates in response to the posture review that deploying small-warhead missiles will lower the threshold for using nuclear arms in a conflict. "I don't believe it lowers the threshold at all," he said. Deploying smaller warhead missiles will make clear to adversaries that the U.S. nuclear deterrent is capable of matching threats posed by low-yield arms. "It's to make certain that no one thinks that they could use a low-yield weapon and put us in a position where we could only respond with a high-yield weapon, with the supposition that maybe we would not," the retired four-star Marine Corps general said. Selva said the two new missiles "will enhance deterrence by ensuring no adversary under any circumstances can perceive an advantage through limited nuclear escalation or other strategic attack." "Fielding these capabilities will not lower the threshold at which the U.S. would employ nuclear weapons," Selva said. "Rather, it will raise the nuclear threshold of potential adversaries, making nuclear weapons employment less likely." The posture review calls for a policy of "tailored deterrence" that will provide a greater array of responses to nuclear forces of other countries. Nuclear deterrence requires varied forces and responses, Mattis said, and therefore the Pentagon is modifying deterrent forces to keep pace with the strategic thinking of adversaries. "If the Russians choose to carry out what some of their political leaders have promoted, which would be to employ a low-yield nuclear weapon in a conventional fight in order to deescalate—in other words, to escalate to victory and then deescalate—we want to make certain they recognize that we can respond in kind," he said. Both Mattis and Selva defended the need to build up all U.S. nuclear forces with new missiles, bombers and submarines over the next 30 years at a cost of between $1.2 trillion and $1.5 trillion. Most U.S. nuclear forces were built in the 1980s or earlier and many are reaching the end of their life cycles. The new arms include new land-based missiles to replace the 400 Minuteman III missiles, the new B-21 bomber to replace aging B-52s, and the Columbia-class missile submarine to replace older Ohio-class submarines. Selva, the vice chairman, said the expensive modernization could take 40 years but "does make sense." "The arsenal and weapons that we have today are ready, secure, and credible, but they must be modernized over the span of time to keep those options available to our commanders in chief," Selva said. Mattis said the military's sole low-yield nuclear weapon today is an aircraft-dropped gravity bomb that is less capable than missiles of penetrating increasingly sophisticated air defenses. "The gravity bomb that is the low-yield [weapon] means the bomber would have to penetrate, but today air defense systems are altogether different than 10 or 20 years ago," he said. "We are certainly working on air defense penetration capability." The re-deployment of U.S. sea-launched nuclear cruise missiles also will bolster U.S. negotiators who will try to persuade Moscow to return to compliance with the 1987 Intermediate-range Nuclear Forces (INF) treaty. "We do not want to forego the INF, but at the same time, we have options, if Russia continues to go down this path," he said. Russia violated the INF treaty with deployment of a ground-launched nuclear cruise missile banned under the accord. Mattis carefully defended the Pentagon's decision to remove references to global warming in the new defense strategy. The Obama administration adopted the questionable policy of asserting global warming posed a major national security threat. "On a military level, every base we have has what we call extreme-weather plans," Mattis said when asked about the omission of climate change in the defense strategy. "We acknowledge any kind of environmental impacts from the weather, whether it be drainage systems or whatever we need in order to keep that base operating, whether it be airfields, seaports, marshaling bases for deployment. This is a normal part of what the military does, and under any strategy, it is part and parcel." Asked about adversaries' use of political, economic, information, and cyber operations targeting the United States, Mattis said building partnerships with democratic states will be key to countering this type of threat that is below the level of military conflict. "We have to remember, we are a revolutionary act, this country, the kind of democracy that we stand for," he said. "And you can practice all the predatory economics you want, you can send your military into Syria to prop up a despot if you wish to, but the fact is we have areas of diplomacy, of education that go far beyond what other nations can reach back and find strength in. And we can use that to build modern partnerships." Mattis said the United States needs to strengthen traditional partnerships, such as the NATO alliance, and broaden of American partnerships with states "that do not want to be basically made tribute states to someone else's economic or political system." On the threat posed by China's efforts to buy American companies to obtain intellectual property or technology, Mattis said he supports proposed legislation that would strengthen federal government controls over Chinese purchases in the United States. The United States has been "basically under industrial espionage" with American intellectual property stolen, Mattis said. "And it's time that we also look at what are the most critical national security industries that may not be covered under the current act that we need to broaden and deepen the protections for this advantage that we have available, whether it be Silicon Valley, Seattle, or elsewhere in the country," he added. Selva said he supports the legislation that would strengthen the Treasury Department-led Committee on Foreign Investment in the United States that can block foreign purchases of critical technology, including the Pentagon's supply chain, to prevent infiltration and technology theft. Mattis repeated earlier criticism of Congress' restrictions on defense spending under the Budget Control Act and urged doing away with the sequestration curbs. "No strategy can survive without the necessary stable, predictable funding," he said. "Failure to modernize our military risks leaving us with a force that could dominate the last war but be irrelevant to tomorrow's security. We need Congress to lift the defense spending caps and support the budget for our military of $700 billion for this fiscal year and $716 billion for next fiscal year." Mattis said that as hard as the past 16 years of conflict have been on the military, "no enemy in the field has done as much to harm the readiness of U.S. military than the combined impact of the Budget Control Act's defense spending caps, worsened by operating for 10 of the last 11 years under continuing resolutions of varied and unpredictable duration." This entry was posted in National Security and tagged China, James Mattis, Military, Nuclear Weapons, Russia. Bookmark the permalink.